The polls have come to a close and I'm proud to say that our recent Exercise in Democracy was bloodless and brief. Thank you all for your votes, and congratulations to all the candidates; I believe I can say you all ran dignified campaigns on firm foundations of Moral Rectitude. But there must be one and only one winner. The result, as you might have seen, was a squeaker: "Our Empire Now" came out on top with 11 votes, "Bad Pennies" with 10, and "Wilhelmina the Conqueror" with 9. While the first got the most votes (congratulations, Jeremy!) it did not win the outright majority (>15) that would have immediately catapulted it into Immortality. More importantly, we have evidence that there were some irregularities in the voting. Several reports from a Southern prefecture in our Glorious Nation describe masses of confused elderly people, befuddled by Blogger's ballot style. Apparently they claimed they voted for "Bad Pennies" but in fact voted for "Wilhelmina the Conqueror". We attempted to call for a runoff at that point between the top two candidates but self-branded "Wilhelminators" beseiged the local police station, where recounts were underway, and threatened to burn it to the ground. You will be delighted to know that their treasonous gathering was Neutralized. Due to the Nationwide Chaos that I believe would have been unleashed if this electoral stalemate were to continue, we are excited to announce that we have handed the victory to the winner of the most votes by the definition established in a famous American court case. While I admit that I am not a trained lawyer (though I moonlight as our Nation's Attorney General), my reading of that case tells me that because the "rights" of certain voters (i.e., those that voted for the losing candidate) were threatened by the outcome of the election (i.e., they voted for the one that lost), it would be best to nullify the attempt to have an election in the first place. And hey, if it's good enough for the nation that brought us Dunk-a-roos, it's good enough for our Wonderful Homeland. So thank you, "Two Extra Armies Each Turn", for nearly three years of service. You will always hold a place in our hearts. Condolences to the losers of the election. You fought a brave battle. You will be expected to turn yourselves in to the State Penitentiary by 6AM tomorrow. End communication. Get back to work. (PS: In all seriousness, thanks for the votes, everyone! We just decided "Bad Pennies" was too good to turn down. Jeremy's suggestion actually won and he deserves full credit for it! Now we owe him two very hospitable stays in exotic locales. So, I don't have time to do a proper new post, as I spent 9 hours editing a soundscape today, and I'm nowhere near done! Another 11 hours tomorrow should do it. w00...t? But, following on the previous post, I have some exciting updates. 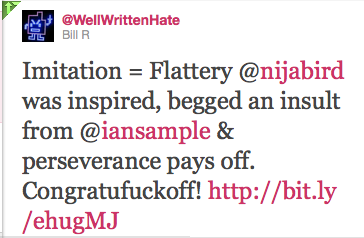 After putting the post up, I sent an email to Bill Ryan, the fellow who originated the idea of getting authors to insult him, rather than just simply signing his copies of their works. I love it. Congrats on your first insult! One time and one time only I tried to ask an author again after she'd rejected me once. It was incredibly uncomfortable and weird, so I decided then and there that if someone says no, I thank them for their time and walk away. I guess Twitter's a little different, though. Plus, it doesn't look like Ian's quite as stuck up as my author was. And that's why I flipping love Twitter. I can't get over it.